Social media has opened many new worlds to me – among them the world of slam poetry and spoken word. In January 2011 I had the opportunity to attend a Tongues of Fire-hosted Victoria performance by the celebrated slam poet, Buddy Wakefield, and heard local performance poet Jeremy Loveday. Not-for-profit fundraiser by day, and spoken word artist and enthusiast by night, Jeremy is one of the driving forces behind the local youth spoken word “scene”. 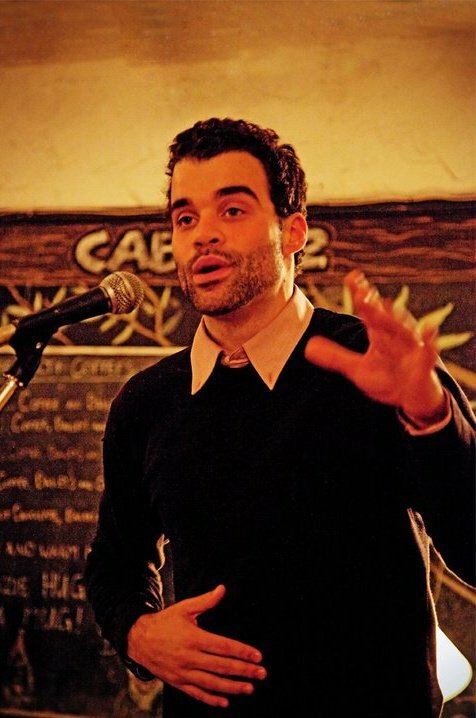 He teaches performance poetry, is the Youth Outreach Coordinator for Tongues of Fire and organizes Victorious Voices, the Victoria Youth Slam Championships (held recently on April 2/4) since 2010. Jeremy was Victoria’s 2010 Individual Slam Champion and a two-time member of the Victoria Poetry Slam team (he’s an alternate on this year’s team too). I wanted to know more about what it was like to live astride two worlds – corporate fundraising and performing arts. Jeremy has been writing poetry since high school, inspired by his Grade 12 teacher at Esquimalt High, Nita Roberts. Performance came much later, in Montréal where he studied Poli-Sci and took the stage in a bar for a magazine launch. After a brief stint travelling and teaching English as a Second Language, Jeremy was hired as a community development coordinator by the Heart and Stroke Foundation, to spear-head the Big Bike fundraiser. Jeremy doesn’t see performance poetry and slam as something new, but rather, as part of the oral tradition of sharing stories and ideas. He’s quick to give credit to past and present teachers and mentors, and besides Roberts, mentions Brad Cunningham, one of the teachers/coaches atReynoldsHigh School. It’s clear that he has a passion for poetry, and wants to share this passion with as many people as possible, whether it is through performance, mentoring, teaching or organizing. Victorious Voices is a great example of bringing this transfer of passion to reality. Originally the competition was held at a local high school, but this year Jeremy wanted to make it accessible to the entire community. I attended the finals on Wednesday April 4th at the Victoria Event Centre, and the venue was packed with an audience of over 200. Next year Jeremy dreams of holding it at Alix Goolden Hall. It was an inspiring evening, full of raw energy and thoughtful prose. It’s hard enough to take your inner-most thoughts, and commit them to paper. To then appear before a group of your peers and agree to be judged for the quality of those words, and your performance, must have been nerve-wracking. And yet, these young performance poets made it seem effortless – a sign of great mastery. To build multiple communities (Big Bike, VicSlam, Tongues of Fire, Victorious Voices), as Jeremy has done, takes skill, work and co-operation. I’m thankful to know him, and look forward to more spoken word to come. Jeremy Loveday appears with Missie Peters, Kyeren Regehr, Iaian Higgins in Poet vs Poet, a spoken word/written word poetry debate to celebrate National Poetry Month. Come Home Canada was chosen as one of the highlights of The 2010 Canadian Festival of Spoken Word.